Screen Grabber for BlackBerry is a simple and lightweight application to take screenshot of a blackberry screen and send it to friends and families. The capture mode can be customized depending on the user. Capture: When capturing the Blackberry screen, Screen Grabber for BlackBerry does leave neither watermark nor ads. The capture can be taken in a matter of clicks. The screenshot can be tools, contacts, maps or addresses. Customization: Options to take the image can be configured depending on the users' needs. For instance, Screen Grabber for BlackBerry lets users take it at full resolution or at reduced file size resolution. That way, the user can easily specify to send it to friends via email or save it in the phone. Saving option: All images will be stored in a secure database named Screen Grabs. They can be organized depending on the user. For instance, some images can be gathered in a single folder so as to view them together afterward. Sharing: As already told above, Screen Grabber for BlackBerry gives users the ability to send the screenshot to friends via email. An icon on the main interface is facilitating the sharing. If not, they are already stored in Screen Grabs. 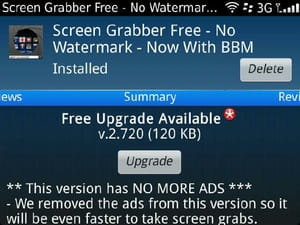 Screen Grabber for BlackBerry can be used and downloaded free of charge. The QR code above enables to download the app. Latest update on April 24, 2015 at 04:48 AM.